SF RNM election night party: Prix fixe menu, $30 for three courses, $26 if you have proof that you voted. SF: Golden Gate Park hot dog stand to close. Co-owner Cary Fong to thank city and customers by giving away 1,500 hot dogs this weekend. SF Niman Ranch's fall Lamb Ranch Tour and picnic lunch is scheduled for Sunday, November 7th. The tour will be in Rio Vista, about an hour and half from San Francisco. They'll also be visiting California Vegetable Specialties, the "premier endive producer in the country." If you are interested in attending or would like more information, send them an email. If you've been to SFO recently, you probably noticed that almost all the terminals are in the midst of major renovations and construction in their food service areas (part of the airport's "food and beverage upgrade program"), which means the pickings are slimmer than ever. Your best bet for pre-security checkpoint eats is the International Terminal North Food Court, conveniently located between the BART/AirTrain connection and the United domestic terminal. Some of the restaurants located in the food court include Lori's Diner, Fung Lum (Chinese), Willow Street Woodfired Pizza, and Ebisu (Japanese). 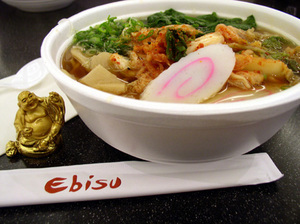 Pictured above is a bowl of kimchi ramen I recently enjoyed at Ebisu's SFO location. Ebisu's original location at 9th Avenue and Irving is one of the more popular sushi restaurants in the city, known for its fresh fish and inventive rolls. The SFO location has a small sushi bar and a full menu of your standard Japanese fare. Certainly worth considering if you're at SFO and find yourself hungry and eager for something other than your typical airport food. NYC Shake Shack has extended their seasonal closing until November 8th and has expanded their menu to include some seasonal offerings like elk, boar, buffalo and pheasant sausages. NYC: The NYTimes explores the dining options that will be available at the new MoMA. "The art and the food are utterly complementary," said Glenn D. Lowry, the museum's director. "The better the food, the more intense the museum experience." NYC: You've gotta love Cynthia Kilian's Smackdown! Per Se vs. Cafe Gray: "Cafe Gray, because patience has a limit." Beard Papa's vs. Krispy Kreme: "Who's your sugar daddy? Beard Papa's." Masa vs. Alain Ducasse at Essex House: "When money is no object, our money (better yet, someone else's) is on Masa."